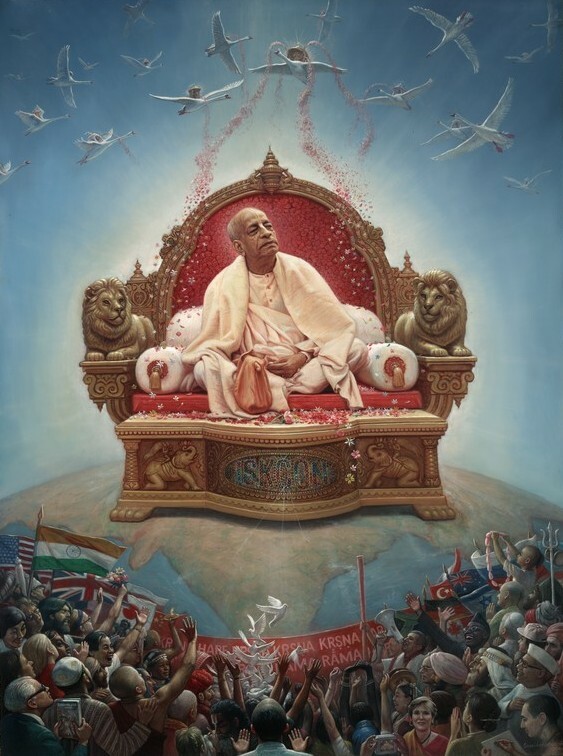 About "The World Acharya Dream"
Some time after Srila Prabhupada left this world, I had a very powerful dream….In that visionary dream, I saw Srila Prabhupada sitting on a huge lion-flanked and jewel-bedecked Vyasasana. His Vyasasana rested on the brightly shimmering globe of Mother Earth, and was positioned just above the sacred land of India. Behind him, the vast curvature of the earth planet was visible. A silvery bluish-white light emanated from the center of the vision, forming a giant oval, in which Srila Prabhupada sat. Below him were many crowds of people–all races, nationalities, and all ages–all the people of the world, reaching out from darkness. They were pointing toward Srila Prabhupada, in awe and wonder, exclaiming, reaching out, praising, and acknowledging him according to their various abilities. Many were in darkness, in worldly life, yet they were all reaching out toward Srila Prabhupada, seeking his mercy. Above Srila Prabhupada, in the shimmering silver-blue sky, many swan-shaped airplanes circled. In these airplanes, devas were singing praises and showering flowers. 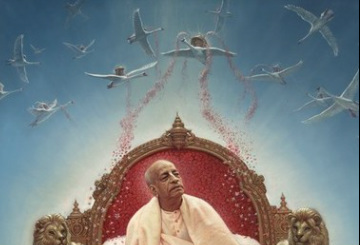 Cascades of colorful blossoms tumbled down from their swan planes, as they glorified Srila Prabhupada. With sweet sounding instruments, and heavenly chorus, they sang “Hare Krishna, Hare Krishna, Krishna Krishna, Hare Hare. Hare Rama, Hare Rama, Rama Rama, Hare Hare…” Their joyful mood spread throughout the universe. They were celebrating Lord Chaitanya’s mission on Earth, and showering blessings upon His Senapati Bhakta, His Commander-in-Chief, Srila Prabhupada. Srila Prabhupada sat regally upon the huge Vyasasana, like a lion king sits atop a mountain. From there he could see all the world and its inhabitants, their sufferings, and their great need for Krishna Consciousness. In his mood of compassionate contemplation, he saw each person’s needs and desires, past and present karmas, and he devised ways to bring their hearts back to home, to love of God. As the dream faded, I was told to take color notes, and was instructed to paint a picture of this vision. And the realization was transmitted to me, that “ISKCON” is Srila Prabhupada’s Vahana, his sitting place, his carrier, just as Lord Shiva has a bull carrier, and Ganesh a rat, and Lord Vishnu, the glorious Eagle Garuda. The information came clearly that “ISKCON” is a divine creation, meant to serve the mission of Lord Chaitanya, and specifically designed to serve Srila Prabhupada’s work in this world–his work of printing and putting out his books, his teachings, and thus scattering seeds of Krishna consciousness far and wide. world. Though it may include all of the above, ISKCON is far more than this, and this realization, described in this dream, will come to people in the future. This vision of Srila Prabhupada in now here for all to see, and to understand that this is only a small glimpse of his greatness. We are indeed fortunate to have lived at this time in history, for in the years to come, generations will look back at this time and consider that Srila Prabhupada, with his ISKCON, is indeed the hero who pulled the Earth planet up from the miserable mire of Kali Yuga. they don’t get lost in the bowels of Kali Yuga, and so they can take this Hare Krishna movement to the next level. Their “adhikar,” eligibility, is far greater than ours. what a lot of pure devotees can do! Srila Prabhupada showed everyone the great importance of his many children, the children of his disciples. They are so dear to him. We all remember how he gave each one a cookie every morning, and how he looked into each child’s eyes to give spiritual transmissions of loving encouragement. These children taking birth from Hare Krishna devotee parents are indeed Srila Prabhupada’s children, his “reinforcements” coming to help establish Lord Chaitanya’s Mission on Earth. To love them, protect them, and guide them is our most important service to Srila Prabhupada. They are the future of Lord Chaitanya’s Movement. see. I will gradually post my book of memoirs here as well, perhaps in the form of an ebook, so that more people can hear about the glorious lila of Srila Prabhupada in this world. Since I am mostly computer illiterate, I wish to express my sincere gratitude to my Godbrothers and Godsisters who are helping me put forth this work as a service to others. I also wish to thank the artist, Satchitananda das, who transferred my dream vision onto canvas in a wonderful way. Right after this dream, I did a complete color sketch, as instructed, and later transferred the sketch onto a big 3’x4’ canvas. It hung on my wall for many years, unfinished. Due to a busy schedule, it seemed unlikely I would ever get it finished. So, while in Vrindaban, I commissioned one very talented Russian devotee artist, Satchitananda das, to utilize his skills and paint my dream vision. He is the best portrait artist I have ever met, and has done an excellent job of painting Srila Prabhupada exactly as he looked in this dream. “wisened acharya look,” and a lot of “looks” in between! In the early days, some of us would often joke, “Swamiji, sometimes you look two years old, sometimes five, and sometimes seventy-two years old! Which are you?” And “Swamiji,” Srila Prabhupada, would just chuckle. Sometimes he would look like a five year old cowlad prankster; other times he would have the regal bearing of the great acharya. We all noticed this. In fact, one girl devotee regularly made saffron cowboy shirts for him! It was just an ordinary part of our “early day” naivete and fun. So capturing Srila Prabhupada on canvas was never easy to do. In this visionary dream, with Srila Prabhupada sitting on the ISKCON Vyasasana, the picture of him that appeared was the one taken of him sitting on a green grassy lawn and peacefully chanting japa. Of course, I always liked his expression in this particular photo, but since it is what I saw in the dream, I never questioned it or considered changing it. So when I commissioned Satchitananda das to paint my dream, I brought him this photo to copy. He then did an excellent job of transferring my vision and color notes onto canvas. But naturally, as a creative artist, he included some of his own embellishments, all of which add to the ultimate grandeur of the finished work. In the crowd below Srila Prabhupada, Satchitananda added the doves, the Hare Krishna banner, the flags, a few of my Godbrothers, and even his five year old son offering a garland to Srila Prabhupada! own artistic inner guidance, I accepted it as Krishna’s arrangement. After all, Satchitananda is a long time resident of Vrindaban, so this painting was done in the Holy Dhama. Krishna (and a little help from Steve Jobs), am I able to even figure out how to turn on one of these devices! My generation grew up in Western society, with the demoniac social values of lust, greed, ambition, and enviousness. Little boys were spoonfed ambition from their cribs. And personal ambition has absolutely no place in the realm of bhakti. So it is not surprising that these twisted values have sometimes seemingly permeated and perverted the pure atmosphere of Lord Chaitanya’s movement. societies, animal rights groups, and so forth. These divine souls, with their higher dimensional realities, will hopefully be able to bring Srila Prabhupada’s transcendental ISKCON into full blossom. Our most important duty at this time, as I see it, is to preserve what was given by Srila Prabhupada, without changing any of his words, his instructions, his books, or his lilas, and to protect, guide, and encourage the divine souls that are taking birth in our world. Srila Prabhupada is not “gone.” He lives forever, in his books, his original writings, his lectures, and his instructions. I am convinced that he is watching the whole show, rearranging things as needed. He is still sitting on his big lion-flanked Vyasasana, witnessing and guiding, and contemplating ways to push forward this glorious Sankirtan Movement started by Lord Chaitanya–the worldwide chanting of “HARE KRISHNA HARE KRISHNA KRISHNA KRISHNA HARE HARE, HARE RAMA HARE RAMA RAMA RAMA HARE HARE.